I’ve been sharing favorite pictures on Wednesdays and since Growing Up Austin’s new sponsor this week is Hazeled Photography, I’ll share this one that Natalie Seebooth of Hazeled Photography took of Sparkles and Buttercup last fall. 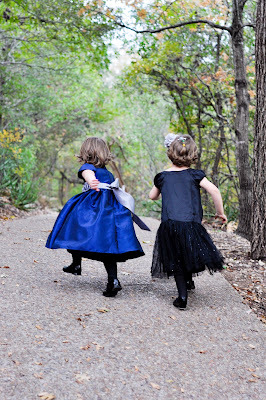 We picked a location that was special to us, on Shoal Creek, near 40th street. I liked Natalie’s style, she was flexible with the girls, paying attention to them and following their lead at times, to get shots that captured their personality instead of looking posed. She let Sparkles hold her favorite bear and Buttercup hold her favorite blankey and those are my favorite pictures. If that style might work for you too, check out her web site for more information! I told you about Sparkles’ recent declaration that she doesn’t like hiking and how I started planning hikes with people she likes. Last week, I planned a hike with Ms. K, Sparkles’ favorite day care teacher of all time. Every now and then, I would need to get to work early, so I would drop off Sparkles and Buttercup early and they would eat their breakfast at the day care. Sparkles LOVED when she got there early. There usually wasn’t another kid there, so Sparkles got to talk with Ms. K all by herself, the whole time. Even when Sparkles moved up to an older class, she still spent her early mornings with Ms. K.
Even when we moved to a new day care, Sparkles asked for play dates with Ms. K and Ms. K asked if she could see Sparkles. Even when Ms. K moved to another town forty minutes away, we still make play dates. Ms. K and Sparkles have a very special connection. When I talked about a hike the other day, Sparkles began her protest. Then I said we were meeting Ms. K and Sparkles couldn’t wait to get to the creek. We all met at Shoal Creek and I didn’t ask Ms. K to help with the whole hiking-protest-delima, I didn’t plan that far ahead, but she helped anyway. It ends up, Ms. K LOVES hiking. Ms. K noticed things on the ground a lot more than I do. She noticed fossils and shells and interesting trash, like pieces of glass and an old shot gun shell. Sometimes it is hard, like when your four-year-old never wants to go hiking again. Sometimes it easy, like when her favorite teacher and hiking hero plants a hiking seed and you can see it start to grow. 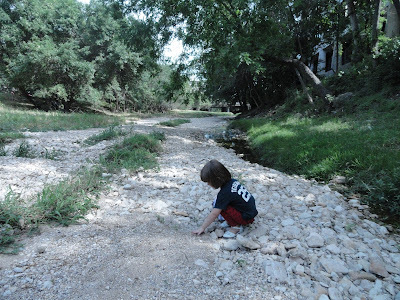 Find more information about Shoal Creek on Austin Kids Hike, this story is from Trail Head #1. And, in other news, this Saturday, June 2nd, is National Trails Day, sponsored by the American Hiking Society, to clean up trails across the country. Find our more and register for the Austin effort here. This is a great chance to hike and do some good at the same time! Here is a picture of them when they both threw a fit at the same time. That makes hiking less fun, when they throw a tantrum and you really do need to get home for dinner. But, I figure that this will happen other places too and we always manage to make it back to the car eventually. For this one, I just waited. I win the waiting game on most days. Find more information about Shoal Creek on Austin Kids Hike, this story is from Trail Head #9.